After being diagnosed with high blood pressure, there are two things that your doctor will mention, other than possible medication. These two things are diet and exercise. Diet and exercise are pretty typical factors when it comes to many health conditions, and for good reason. Both of these factors make a huge impact on your overall health, and can seriously contribute to your overall well-being. As with many chronic health conditions, what you eat has a major impact on your health. It is easy to forget, or not truly realize, how much depends on the food that you consume. The truth is, however, that bad foods can cause problems, and a healthy diet can truly improve your life. The foods you eat can make or break not only what your results are during doctor’s appointments, but they can seriously affect how you feel on a daily basis. High blood pressure, when left untreated, can cause a host of uncomfortable symptoms. You could end up experiencing debilitating headaches, dizziness, fatigue, difficulty sleeping, and more. By treating your high blood pressure with the medication and lifestyle that your doctor prescribes, you can prevent yourself from suffering. When you really think about it, it makes sense that the foods you eat can affect your body so much. Each bite of food and sip of beverage goes into your body, is broken down, and is processed by your different body systems. The byproducts of the materials you ingest are filtered into your blood, passed through your heart and blood vessels, and circulated through your entire body. Exercise is one of the ways you can counteract much of the effects of the foods you eat and strengthen all parts of your body, not just your muscles. 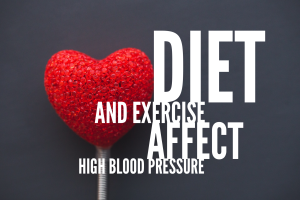 There are multiple positive effects of regular exercise that can help you with your high blood pressure. Exercise strengthens your entire body, from the muscles that you can see and feel, to the muscles in your heart, and every other part of your body. By engaging in regular exercise, cardiovascular exercises specifically, you are doing your body a huge favor. Exercise can help lower your blood pressure by strengthening your heart and the blood vessels that pump blood throughout your body. Exercise can also lower your blood pressure through the loss of excess body weight. While it is true that even people who are not overweight can have high blood pressure, you are a lot more likely to suffer with this condition if you are overweight. Too much extra weight on your body can lead to stress on your heart and body, and raise your blood pressure. Diet and exercise are an integral part of any healthy lifestyle, whether you are living with health conditions or not. For people with high blood pressure, diet and exercise are more important than ever before. Maintaining a healthy diet will help you control what you put into your body, and exercise will help your body to function properly so you can live a good, long, healthy life. Click here for a meal plan to help.